A ring is a round band, usually in metal, worn as an ornamental Jewellery around the finger, or sometimes the toe; it is the most common current meaning of the word "ring". 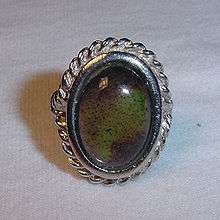 Strictly speaking a normal ring is a finger ring (which may be hyphenated); other types of rings worn as ornaments are earrings, bracelets for the wrist, armlets or arm rings, toe rings and torc or neck rings, but except perhaps for toe rings, the plain term "ring" is not normally used to refer to these. 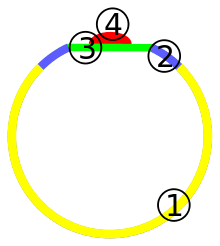 The parts of a ring. 1: Hoop. 2: Shoulder. 3: Bezel. 4: Stone or gem in setting/mounting. Although tracing the exact history is difficult, the custom of giving and receiving finger rings dates back over approximately 6,000 years. The Hittite civilization produced rings, including signet rings, only a few of which have been discovered. People in Old Kingdom Egypt wore a variety of finger rings, of which a few examples have been found, including the famous scarab design. Rings became more common during the Egyptian middle kingdom, with increasingly complex designs. 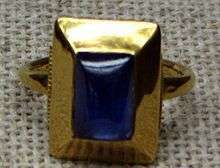 Egyptians made metal rings but also made rings from faience some of which were used as new year gifts. Native styles were superseded by Greek and Roman fashions during the Ptolemaic dynasty. Archaic Greek rings were to some extent influenced by Egyptian rings, although they tended to be less substantial and apparently weren't for the most part used as working signet rings. A lack of locally available gold meant that rings made in the eastern colonies tended to be made from silver and bronze while Etruria used gold. The classical period showed a shift away from bronze to wider adoption of silver and gold. The most typical design of the period involved a lozenge bezel mounting an intaglio device. Over time the bezel moved towards a more circular form. During the early and middle imperial era (first two centuries AD) the closest there is to a typical Roman ring consisted of a thick hoop that tapered directly into a slightly wider bezel. An engraved oval gem would be embedded within the bezel with the top of the gem only rising slightly above the surrounding ring material. Such rings are referred to Henig II and III/Guiraud 2 in formal academic parlance or simply as Roman rings by modern jewellers. In general Roman rings became more elaborate in the third and fourth centuries AD. 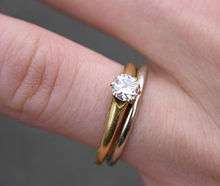 The fourth digit or ring finger of the left hand has become the customary place to wear a wedding ring in much of the world, though in certain countries the right hand finger is used. This custom was practically established as the norm during World War II. The use of the fourth finger of the left hand (the 'ring finger') is associated with an old belief that the left hand's ring finger is connected by a vein directly to the heart: the vena amoris or vein of love. This idea was known in 16th and 17th century England, when Henry Swinburne referred to it in his book about marriage. It can be traced back to ancient Rome, when Aulus Gellius cited Appianus as saying the ancient Egyptians had found a fine nerve linking that particular finger to the heart. While the ISO standard defines ring size in terms of the inner circumference in millimeters various countries have traditional sizing systems that are still used. After several thousand years of ring manufacture the total number of styles produced is vast. Even cataloging the rings of a single civilization such as the Romans presents a major challenge. As a result, the following list should be considered to be very limited. Aqiq ring A carnelian or agate ring worn by some Muslims in imitation of Muhammad. Birthstones ring Usually a slender, simple ring (sometimes consisting of a band), set with the wearer's birthstone, or the birthstone of the wearer's spouse. Those like the Mother's ring can be worn set with various birthstones. Some couples wear birthstones set with a wedding anniversary month birthstone as well as other commemorative stones. Cameo (carving) ring A plain hoop mounted by a table setting, into which is affixed a carved cameo. This ring style is exceedingly ancient and was more commonly worn by men than by women. Ancient cameos depicted pagan gods, Christian saints and even self-portraits. Multi-coloured stone and often marble or porphyry was most desirable, as it produced a striped, layered or three-dimensional effect. The modern cameo ring usually shows the profile of a goddess or a Roman soldier. Championship ring a.k.a. sports ring A ring presented to members of winning teams in professional sports leagues as well as college tournaments in the Americas. The best known of these are the Super Bowl ring and World Series ring. 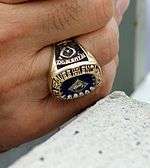 Also, in professional American sports leagues—such as the National Football League (NFL) and Major League Baseball (MLB)—the runners-up of the league championship game/series is awarded a ring, being the champion of their conference (sub-league). 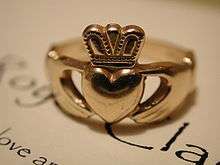 Claddagh ring An Irish friendship, courtship or engagement ring. It is traditionally used to indicate the state of romantic availability. In recent times it is commonly worn as a wedding ring. In centuries past, this ring was bequeathed from mother to daughter, though men also wore it. Class ring Worn by students and alumni in commemoration of their graduation. Cocktail ring An oversized ladies' ring with a large center stone often surrounded by tiny stones. Nearly any oversized ladies' ring may be termed "cocktail". This is the most common type of costume jewellery ring and is also known as a cluster ring and dinner ring. Doctoral ring A gold ring worn by a scholar who earns a doctoral degree at a Danish or Swedish university. In America it is common for priests who have earned their doctorate in theology to wear such a ring on the right hand ring finger. Ecclesiastical ring A religious ring, either of authority for clerics or as some other special religious symbol. When worn by bishops or higher-ranking priests, it is called "Episcopal ring". Engagement ring A ring given to and worn by a woman signifying her engagement to be married. Eternity ring A ring symbolizing eternity with a partner. These are often given in lieu of engagement rings, as when former UK Prime Minister Gordon Brown purchased one for his wife (as a recompense for not having originally proposed to her with an engagement ring). Finger armor ring A ring style which spans from the base of the finger to just below the fingernail or middle of the second joint. This type of ring includes a bending joint. Friendship ring Friendship rings are used to symbolize a close relationship whether romantic or platonic. Its common usage is as a token of friendship. Gay Pride ring (a.k.a. "Rainbow ring") Representing gay pride, usually a band, either set with seven stones or inlaid with seven enamelled lines, in the seven colours representing the Rainbow flag (LGBT movement). In decades past, a stone-set ring worn on the right hand ring finger or the pinky of either hand represented a call for gay equality. Giardinetti ring Italian for 'little garden' a design which features an openwork bezel containing multiple small stones. Most prominent in the second half of the 18th century. Guard ring (a.k.a. ring-guard) is a slender, slightly tighter-fitting ring designed to be placed on the finger after a large/loose ring, to prevent slippage and ring loss. Iron Ring, a.k.a. Engineer's Ring Ring worn by American and Canadian engineers, after swearing the Engineer's Oath. This is often in the form of a crudely worked piece of iron; modern rings tend to be sleek steel, some with etched geometric designs. The ring is meant to be worn on the pinky (little) finger of the dominant hand at all times. This ring has been loosely associated with Rudyard Kipling. Key Ring A ring with a key mounted on the bezel. Used by the Romans as both a means of carrying a key to their family valuables chest and to demonstrate their status within the family. Memento mori ring Largely dating from the 16th to the 17th centuries, memento rings featured a skull and the inscription "Memento mori", sometimes combined with other features. Mood ring A novelty ring which changes colour in response to body temperature, using a thermochromic liquid crystal. Mother's ring A ring worn by a mother displaying the birthstone of each of her children, and sometimes including those of the mother and father. Mourning ring A ring worn in memory of someone who has died. Also commonly called a "memorial ring". Use attested from at least the 14th century AD to the late 19th century. Multi-finger ring Two or more laterally conjoined rings, designed to be worn on two, three, or four fingers; popularized by hip-hop culture. Penannular ring Found in gold or gilded metal from Bronze Age Britain, these small thick incomplete circles are the wrong size and shape to be finger-rings and were probably worn as nose or ear-rings or attached to the hair or clothing. Poison ring A ring consisting of a bezel with a compartment. Despite the name they were probably more commonly used to hold things like perfume or romantic keepsakes. Posie ring A ring with a lengthy inscription on its outer surface. These were commonly used as engagement and wedding rings. Also referred to as "posy" or "poesy" rings in reference to the line of poetry most commonly used in the inscription. Pre-engagement ring A small, inexpensive ring given to a partner, signifying the promise not to court anyone else. Promise ring A ring worn to remind a person of a promise. These evolved in conjunction with wedding and religious vow rings in the sense that the ring represented the vow/promise. Purity ring A symbol of virginity and a vow to keep virginity in some religious cultures. Puzzle ring Interlocking rings forming a single band. A famous example is the classic Cartier "Trinity" wedding ring. Regards ring A Victorian engagement ring with an implicit acrostic: Ruby, Emerald, Garnet, Amethyst, Ruby, Diamond, Sapphire. Rosary ring Also known as a Decade ring. Ring worn around the finger with 10 indentations (or protrusions) and a cross as a bezel, representing one decade of a rosary. The rings are used to keep track of place in the prayer by rotating the ring on a finger and feeling the marks. Signet ring An emblematic ring, often bearing a family coat of arms, some of which are fit for use to imprint a wax seal. In the event a seal or at least a representation of a seal is on the ring, it is called a "seal ring". The signet may bear anything from a custom-designed escutcheon to simple initials, in which case it is known as an initial ring. Sovereign ring A large solid gold ring set with a gold sovereign. SS-Ehrenring Nazi "honour ring" or "ring of honour". A plain silver band decorated with a death's head. Awarded to members of the Nazi SS (Schutzstaffel). A similar ring (in the form of a death's head) was also favoured by the SS-SD (Schutzstaffel-Sicherheitsdienst), and was very secretive in design. There were in fact several different award rings during the Third Reich. Thumb ring Originally thumb rings were used as an archery implement mainly in eastern styles of archery. Thumb rings are an extremely ancient custom. Toe Ring Toe rings have a particular function in India. They are considered a customary ornament to be worn by married women. Watch ring A small watch fashioned to be worn as a ring. Wedding ring A ring presented at the time of marriage to signify espousal and marital commitment. Originally worn only by women, it is now common for both spouses to wear such a ring. Midi ring A ring worn above the knuckle. Made popular in fashion around 2012. Ring of the Fisherman a.k.a. Papal Ring, the signet ring of office of the Pope. The One Ring (Sauron's Ring), from J. R. R. Tolkien's Lord of the Rings and Hobbit. ↑ Jones, William, (1890) Finger Ring Lore. 1 2 3 4 Taylor, Gerald; Scarisbrick, Diana (1978). Finger Rings From Ancient Egypt to the Present Day. Ashmolean Museum. p. 31. ISBN 0-900090-54-5. ↑ Ogden, Jack (1992). Ancient jewellery Interpreting the past. University of California Press. p. 60. ISBN 0520080300. 1 2 Taylor, Gerald; Scarisbrick, Diana (1978). Finger Rings From Ancient Egypt to the Present Day. Ashmolean Museum. p. 33. ISBN 0-900090-54-5. 1 2 Taylor, Gerald; Scarisbrick, Diana (1978). Finger Rings From Ancient Egypt to the Present Day. Ashmolean Museum. p. 34. ISBN 0-900090-54-5. 1 2 3 Johns, Catherine (1996). The Jewellery of Roman Britain Celtic and classical Traditions. Routledge. p. 42. ISBN 9780415516129. ↑ Johns, Catherine (1996). The Jewellery of Roman Britain Celtic and classical Traditions. Routledge. p. 48. ISBN 9780415516129. ↑ Kunz, George Frederick, (1911) Rings for the Finger. ↑ McCarthy, James Remington, (1945) Rings Through The Ages. ↑ Church, Rachel (2014). Rings. V&A Publishing. p. 55. ISBN 9781851777853. ↑ Rosanna Greenstreet (24 April 2010). "Election Q&A: Gordon Brown | Politics". London: The Guardian. Retrieved 2012-11-07. 1 2 "Giardinetti ring". ashmus.ox.ac.uk. University of Oxford - Ashmolean Museum. Retrieved 17 March 2015. ↑ "Ring". V&A Images. Victoria and Albert Museum. Retrieved 12 January 2013. 1 2 Tait, Hugh, ed. (2006). 7000 Years of Jewellery. British Museum Press. p. 239. ISBN 9780714150321. ↑ Hix, Lisa (22 January 2014). "From Hummingbird Heads to Poison Rings: Indulging Our Antique Jewelry Obsession". Collectors Weekly. Market Street Media. Retrieved 7 March 2014. ↑ "Decade ring". ashmus.ox.ac.uk. University of Oxford - Ashmolean Museum. Retrieved 16 March 2015. ↑ JAV Designs. "Schutzstaffel: The SS". Germaniainternational.com. Retrieved 2012-08-13. ↑ Culture and Customs of India - Carol Henderson Garcia, Carol E. Henderson - Google Books. Books.google.co.in. Retrieved 2012-08-13. 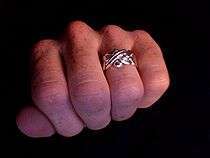 Wikimedia Commons has media related to Finger rings.